Synopsis, Our Opinion: OUTSTANDING California white wine. 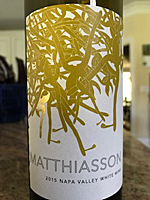 Producer/Winery: Matthiason Family Vineyards; Napa, California. Grape Variety: Blend – 50% Sauvignon Blanc, 25% Ribolla Gialla, 20% Semillon and 5% Tocai Friulano. 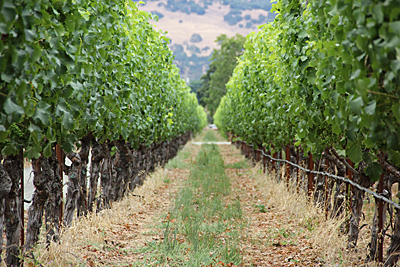 Geographic Appellation,, Region, Country: Napa Valley, California. Paired With: Wholewheat pasta and chicken with Pesto alla trapanese, Parmesan cheese and a garden salad. Chilled before drinking. Clear, wheat straw color. Very light pear, lemon and tropical fruit aromas. Smooth, tightly structured, lively, solid medium body and a 200-grit texture. Lots of lemon, peach, pineapple and a tad of petroleum flavors. Edgy acidity and a long zesty finish that carries an unusual mineral taste on and on. Other than the light aroma this was a FANTASTIC white blend. Striking freshness with substantial body, a tartness to the lemon that was really provocative and a richness that created an elegance to the wine. ABSOLUTELY SUPER paired with the Pesto alla trapanese pasta and refreshing sipping after the dinner. Not inexpensive, but an excellent value for a unique and OUTSTANDING California white wine. Photo from Matthiason Family Vineyards. Comments: Learn more about Matthiason Family Vineyards and their wines.